Now with all the latest German spellings included, Collins Easy Learning German Words helps you develop your vocabulary and is the perfect companion to any of the ever-popular Easy Learning German range. 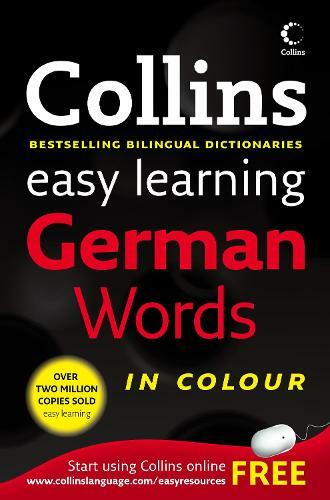 Now with all the latest German spellings included, Collins Easy Learning German Words is designed for learners of German of all ages, whether you are learning at school, in an evening class, for business or to go on holiday. * Easy to use: Collins Easy Learning German Words gives you all the vocabulary you need in order to communicate effectively in natural German. * Easy to read: clear, colour layout and handy vocabulary sections ensure that you find what you are looking for quickly and easily. * Easy to understand: example phrases show you how German is really used. Other titles in the Easy Learning range include: Collins Easy Learning German Dictionary, Collins Easy Learning German Grammar and Collins Easy Learning German Verbs.